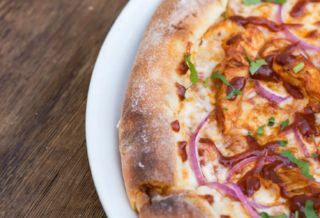 An eclectic blend of restaurants, bars and entertainment makes this the pulse that combines New York-New York, Park MGM and T-Mobile Arena into one community. All of the venues are outfitted with outdoor patio seating to make everyone feel like they are part of the action. The art and horticulture programs for The Park are inspired by the desert landscape, which creates a vibrant and unique ambiance that is unlike anything else on The Strip. Toshiba Plaza provides two acres of entertainment activation space. 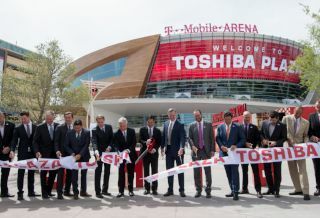 With three stages including the mezzanine stage attached to T-Mobile Arena, Toshiba Plaza is perfect for fan fests, sponsorship activation’s, outdoor concerts and TV broadcasts. Measuring 175 feet wide and 45 feet high, the video mesh wall on the side of T-Mobile Arena not only provides advertising space but also an opportunity to show sporting events, movies and premiers. 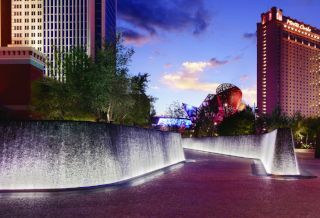 Toshiba Plaza connects to the Park, New York-New York and Park MGM which provides guests with opportunities for dining and entertainment pre- and post- event. Get there quick! Find the best accommodations near the venue.